I am flagging, a little. I am daunted by the Wise Men~ 48 of 'em. But here are some recent pictures of my progress. I sold subscriptions on 12 sets and have set myself the goal of 3 more~ one for us and two for sale as the holidays approach. 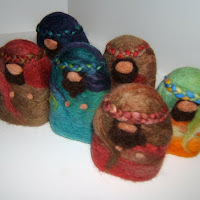 Each set is completely needle felted and includes 8 pieces: Mary & Jesus, Joseph, 3 Wise Men, 2 shepherds and an angel. Each subscriber has also chosen the animal add on set: donkey, sheep, camel. The pieces are made of one piece each (no small parts) and intended to be handled by children. They have blank faces in the Waldorf tradition which encourage s a child's imagination to fill in the features and expression. The wool warms in little hands and has a gorgeous, touchable texture. Hands on play encourages kids to learn the story and play with themes, character and ideas. I'll keep you posted if my arm doesn't fall off from all the jabbing, first! At this point I have all my Marys done, 15/16 Josephs, about 8 shepherds and a couple wise men. 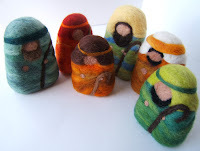 You can see all my Nativity Projects posts here. I'm wanting do make a little nativity scene for this year ... better get making - but I'm not sure what to make them out of! Yours are sweet - I love the baby Jesus! I keep getting more excited each month as I see our figures take shape. I can't wait until they get here and we can play with them. Gorgeous.